Lately I’ve been going through my house, repainting, redecorating, fixing, organizing room by room. I wasn’t going to redo my son Peyton’s room, but when he saw me painting everywhere else he asked if I could please paint his room too. And make it RED. His favorite color. Well, I decided against painting the walls red, and instead opted for accessorizing the room with red pieces. 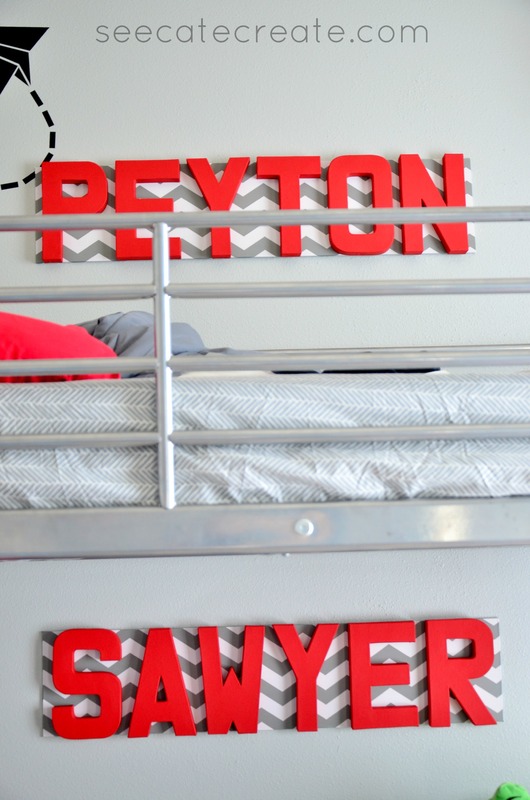 Sawyer, the little brother, is soon going to be bunking with Peyton so I wanted to incorporate him into the room as well. 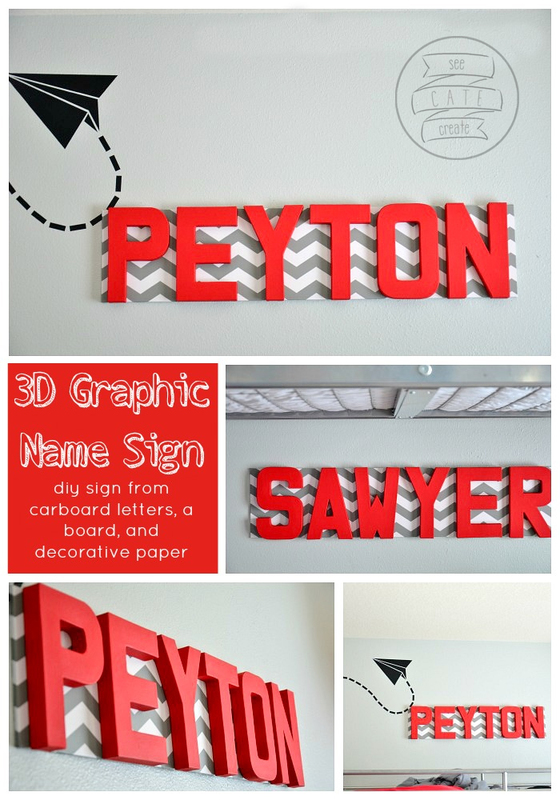 I really wanted something bold and graphic above their beds and decided to make a diy name sign | graphic 3d boy’s room sign out of some simple materials I found at the craft store. Their room is a complete disaster right now so I’ll have to get pics of the entire room for you later in one of those miraculous moments when it is actually CLEAN. For now, here is the sign project. 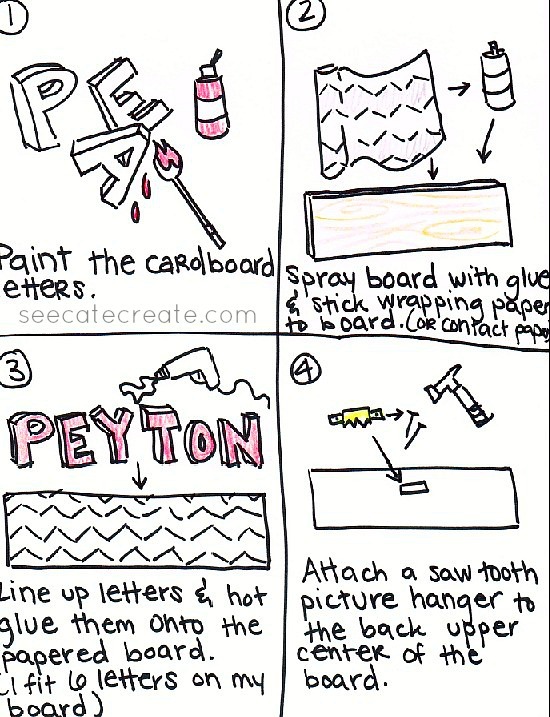 Cost: About $20 per sign (depending on how many letters you need to buy and if you have a coupon or they’re on sale). Craft paint in the color of your choice. 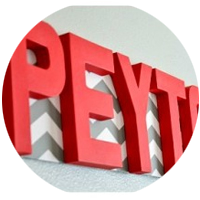 A thin board the height of your letters and as long as you need for the name you’re creating. Decorative paper (wrapping paper or contact paper (I used contact paper that I got at Ross for $2 a roll)). A saw tooth picture hanger and nails and a hammer. I’d like to know, would you paint an entire room RED?